Just another beautiful recipe to add to my Roaster Oven group I hope you take the time to include a recipe you use in yours! * Place roast in bottom of COOKING PAN. 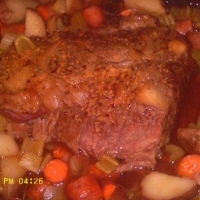 * Place vegetables around sides of roast. * Add salt, pepper and broth. * Cover; cook at 250°F 3 to 4 hours or until tender. This sounds good. Have you ever tried it with mushrooms? Like LindseyB's recipes? Never miss an upload!